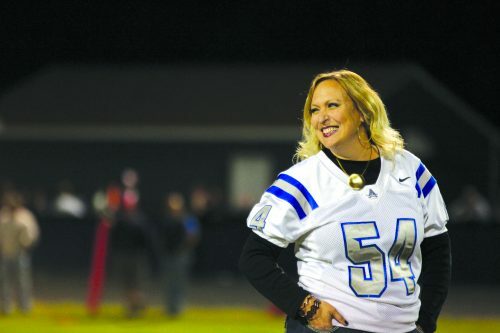 Center director Heidi Craft smiles at the crowd as they chant her name during the Varina vs Atlee football game. Craft was selected as honorary captain for the game which remembered her late husband, Henrico Co. Police Lt. David Craft. After 21 years of having the same director of the Center for Communications and Media Relations, the school has finally gotten a new one. Mrs. Heidi Craft is the second director the Center has had since its opening. “The couple times that I spoke to her she seems to be smart, very articulate, and I think she’s excited about being the new director. I think she’ll do a great job,” Former communication director Ms. Beverly Lanier said. Mrs. Craft said that she knew she was the person who could advocate for the Center and get the things that the program really needs. Her husband, Henrico County Police Lt. David Craft who passed away suddenly this summer, was her biggest motivator to get her to take on the position. “He kept saying 2017 was the year of changes because that was the year our daughter was going to college, I was going to take a new job, and he was going to look into a new job in his police department,” Mrs. Craft said. Since she’s been at the Center, Mrs. Craft students are very welcoming and accepting of her. “She’s very nice, helpful, and easy to talk to,” Freshman Anihya Clark stated. Director of School Counciling Christina Naumann says she knows it’s a lot of differences switching schools, but she’s here to help Mrs.Craft learn Varina and the Center, but most importantly make her feel welcom. “I’m excited about Mrs. Craft being here, I think she has a lot of great ideas.” Ms. Naumann said. With 15 years of experience, Mrs. Craft says that she has a lot of ideas on how to enhance the program. In college she majored in English and double minored in journalism and professional writing at Longwood University where she was also a copy editor for the college paper. Mrs. Craft taught journalism at Atlee high school where she ran a successful yearbook and newspaper programs. “She has a lot of experience and within her first two weeks she taught me a lot of stuff. She actually makes the Center fun,” Junior Amber Townes says. Mrs. Craft’s biggest focus is building internship programs and improving the TV studio that has been the same for a long time. “I would really like to upgrade all of our equipment to the 21st century so we can have that cutting-edge technology” Mrs. Craft says. Within the next few years Mrs. Craft would like for the Center to explore trends. She says social media is a platform that has so many things that communication students should be connecting to. In Mrs. Crafts eyes communication is something that cannot wait years to be changed because the communication world changes on a regular basis. The Center has an Instagram, Twitter, and Facebook account that are updated regularly. The biggest thing Ms. Craft wants her communication students to get from this program is the ability to communicate well because it’s important when it comes to their leadership and personal growth. “With her being here I know the Center will become bigger in the next couple of years” Townes says.